Ben Lecomte has swum across the Atlantic Ocean, and now he aims to traverse the Pacific, which will take him five or six months. 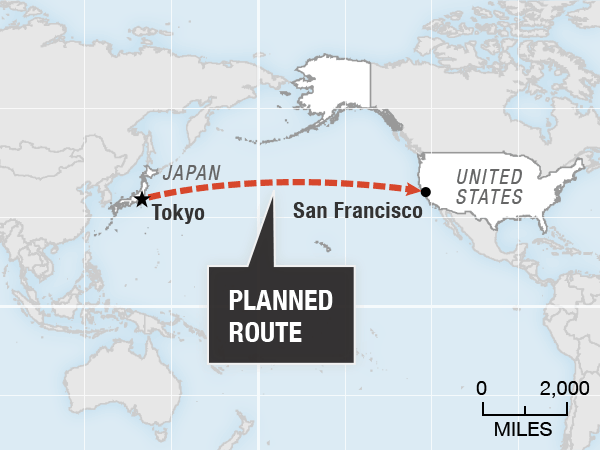 Any day now, Ben Lecomte will plunge into the Pacific Ocean off a Tokyo beach toward San Francisco. He wants to become the first person to swim across the Pacific. He's already the first person to free swim across the Atlantic Ocean, without a kickboard. No one knows how the physical feat of swimming 5,500 miles will affect Lecomte's heart, but cardiologists are anxious to find out. 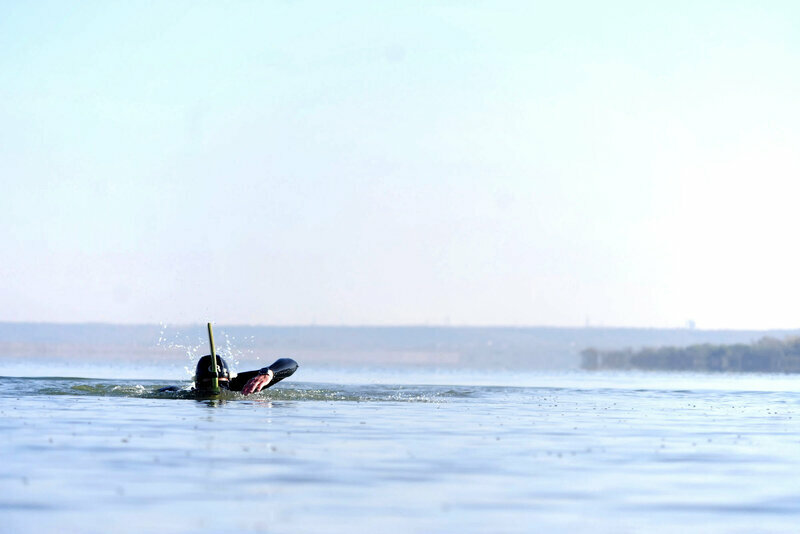 His swim offers a rare opportunity to study whether extreme athletic performance has a harmful effect on the heart. After he completed the swim across the Atlantic in 1998, the first words out of Ben Lecomte's mouth were "never again." Now this 48-year-old, French-born American is about to embark on a swim expected to take five to six months. "I'm not a fast swimmer," Lecomte says. But boy is he dedicated. "Swimming is a passion," he says. "You cannot just push it away." Lecomte, who lives in Austin, Texas, is diving back into the ocean to focus attention on environmental problems. He's worried about the future for his kids. During the swim, he will collect data on the Pacific, including the microbes and trash he encounters. People can follow along on his Facebook page, The Longest Swim. He will also collect data on himself, including how his heart holds up for eight hours of freestyle every single day. This data will go to Benjamin Levine, a cardiologist at UT Southwestern Medical Center and director of the Institute of Exercise and Environmental Medicine at Texas Health Resources. "My question has always been, how much exercise do you need to do to injure the heart?" Levine says. "Since Ben was planning to swim across the Pacific Ocean, we thought, hey, this might be a good opportunity." Lecomte will gather data on the environment and on his own health during the Pacific swim. After all, we're told more exercise is better — and generally, it is. Yet several studies of extreme endurance athletes have called that idea into question. People who run marathons or do triathlons can have some scarring or fibrosis in the center of the heart, says Paul Thompson, chief of cardiology at Hartford Hospital in Connecticut. "Right where the two sides of the heart join each other — the septum." This scarring at the septum is worrisome, Thompson says, particularly for people who have an underlying genetic condition that weakens the heart muscle. And there's a second area of concern. "It's been shown in a couple of studies now that people who are lifelong endurance athletes have more coronary artery calcification than you would expect for their risk factors," Thompson says. Calcification, meaning a buildup of calcium in the heart, is not something you'd expect to find in people swimming long distances, running ultramarathons or tackling Ironman competitions. There could be a genetic explanation to both the calcium issue and the scarring, Thompson says. So he advises people to study up on their family history and see if there have been cases of sudden death, then weigh the benefits and risks of extreme exercise. "We don't think that long-term exercise is dangerous, because long-term endurance athletes live longer than other people," Thompson says. But Thompson does want to figure out what's going on. Which brings us back to Ben Lecomte and the tricky task of monitoring his heart from the middle of the ocean. Using technology that NASA uses for monitoring astronauts on the International Space Station, UT Southwestern's Levine will be able to monitor Lecomte's heart during his swim. It's a small echo machine, like an ultrasound for the heart, that will be on the support boat traveling with Lecomte. Once a month, while resting on the boat, Lecomte will turn the machine on and use a satellite phone to call the Johnson Space Center. 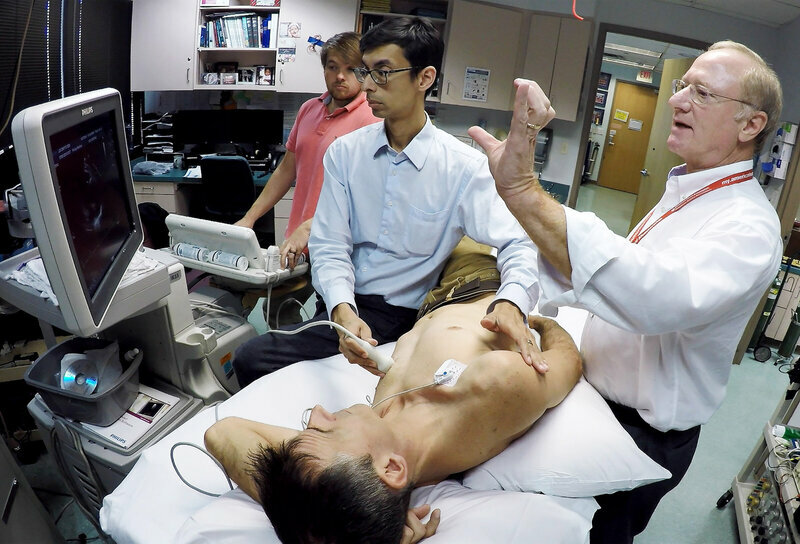 Dr. Benjamin Levine performs an echocardiogram on Ben Lecomte to record a baseline of his heart function at the Institute for Exercise and Environmental Medicine in Dallas. Someone there will tell Lecomte how to position the probe to give himself an echocardiogram. From his desk in Dallas, Levine will see images of how fast Lecomte's heart is contracting, how quickly the blood flows in and out of the valves, and any stress where the two sides of the heart meet. "I think when he comes back he'll have signs of a little inflammation or irritation right where the right and left ventricle connect," Levine says. "That's what we see in some other of these elite long-endurance athletes, and I think that's what we'll see in Ben." For most people this inflammation is really of no consequence, Levine says. But for some people — for example, those who have pulmonary hypertension or other kinds of heart disease — it could cause problems. He hopes studying Lecomte's heart will help reveal why extreme exercise changes the heart and determine whether there's a limit to how much exercise the human heart can handle. Ben Lecomte is not worried. He thinks his heart can handle the enormous ocean, some 20-foot-high waves and the occasional shark.